Cory, pregnant here in 2014, and Jeremy decided to build a second shed to the left of this 12′ by 16′ for Jeremy to use for computer work. 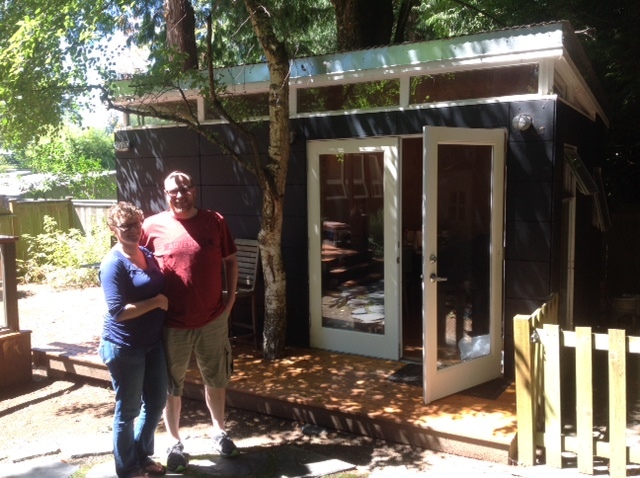 The couple purchased the home, a four-bedroom 1950s rambler, and turned one of the bedrooms into a guest room, while Jeremy took over the 12’ by 16’ Modern-Shed for his studio. They could not have expected that over the next couple years, they’d buy not only their own Modern-Shed, but two more, bringing the total number of sheds on their property to four. First, the couple learned they were expecting another child and decided they wanted to turn their guest bedroom into a nursery. They converted the 12’ by 16’ studio into a guest suite, since it already had its own bathroom, and purchased a 10’ by 12’ Modern-Shed for Jeremy to use as his studio and guys’ space. Working on projects close to home, rather than commuting to an office or other space, frees up Jeremy’s time for family and other pursuits, like marathon training. Meanwhile, the couple faced storage challenges in their home. Depending on how you look at it, the couple lucked out when a windstorm crushed the shed earlier this year. 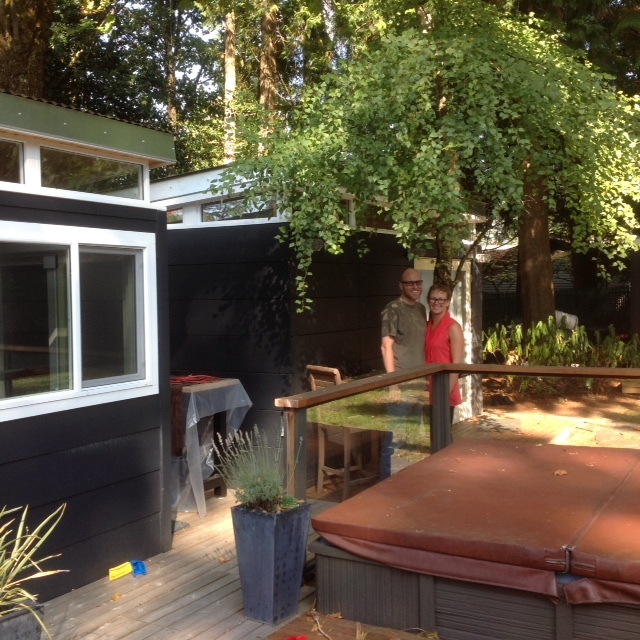 They debated whether to buy another pre-built shed sold at hardware stores to replace it, but didn’t like the look or feel of those. A 10′ by 12′ studio sits next to the 12′ by 16′ guest suite, blending with the couple’s home in the background. previous garden shed had sat, there was now room for another shed that Cory could use as an art studio of her own. 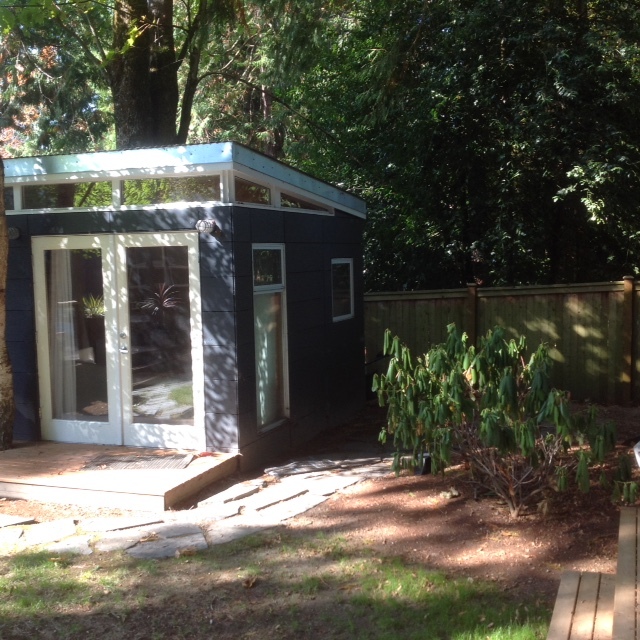 The fourth shed, another 10’ by 12’ studio, will be built this month and will connect to the guest suite and Jeremy’s shed via a deck. The sheds are all black with white trim, like the couple’s house, blending in seamlessly. Cory and Jeremy also liked that the sheds were customizable and could come with a variety of doors and windows. 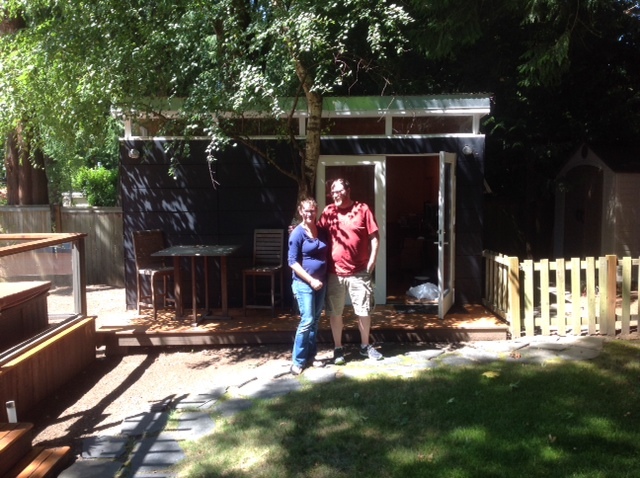 Working with Modern-Shed’s builders has also been a great experience, Cory added. Learning they could build a shed on their property without a permit, as long as it was less than 200 square feet, was an eye-opener as well, Cory said. Due to the way their yard is configured, the couple had a lot of space to work with and much of that space couldn’t have been used for other purposes. The couple’s fourth shed will sit to the right of the guest suite. 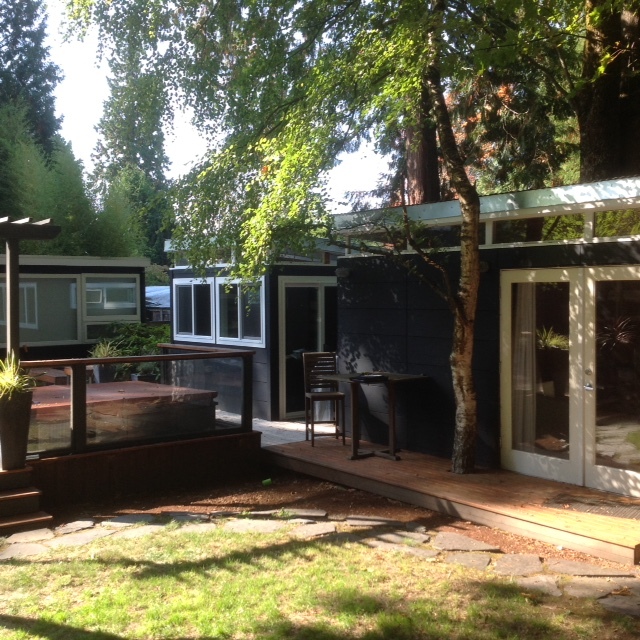 Many of the homes in the couple’s neighborhood, including their own, were built by celebrated Seattle architect Paul Hayden Kirk, and the couple’s home was part of a Docomomo home tour last October. Docomomo International is the international committee for the documentation and conservation of buildings, sites and neighborhoods of the modern movement. < Previous We’ve been featured….